Note: I originally wrote this story for the NAWCC Watch & Clock Bulletin (W&CB) for the March/April 2016 issue. But due to differences between myself and the new editor that could not be resolved, the story never ran. So here it is for your hopeful enjoyment. 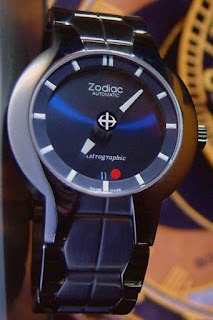 I have long admired the Zodiac brand of watches for their great quality and affordability. They fit right in with the philosophy of this blog --- that great vintage watches need not necessarily be expensive. 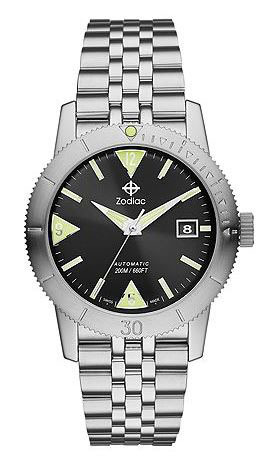 I first wrote about Zodiac watches in August of 2005 for the W&CB. Since then, there have been several significant discoveries and developments about the brand that I wanted to share with you. But first, let's review the history of Zodiac from inception to year 1978 for those of you who don't have access to W&CB. (The significance of year 1978 will become clear in a few minutes.) This history is well documented on numerous websites, so I am only going to do a few bullet points from their highlights. If you want more info, I suggest you visit www.vintagezodiacs.com. * 1864: Ariste Calame (1839-1917) establishes a workshop in LeLocle, Switzerland. The company is founded in 1882 and is known simply as "Ariste Calame." 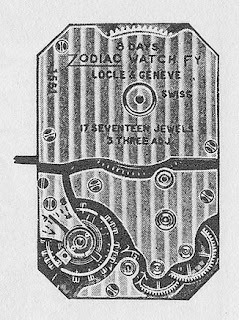 The name "Zodiac" is occasionally seen on some pocket watches, but was not trademarked until 1908. * During the early years, the company manufactures movements and movement parts for other companies, notably Favre-Perret and Seiko of Japan (believe it or not, Seiko has been around since 1881). 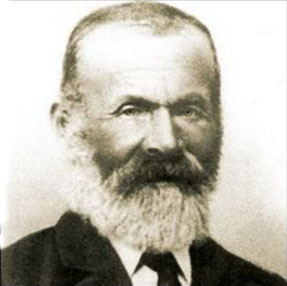 * 1895: Son, Louis-Ariste Calame, takes over the company. Other family members join the company and the company remains family owned and operated until 1978. * mid-1930s. Zodiac builds a series of in house wrist watch movements. Two notables are an eight-day Caliber 1551 movement, and another (Caliber unknown) with a patented shock-proofing system. In the photos below, you can see the patented "Z-clip" over the balance that provides shock protection. Both movements are so obscure they are not even listed in the Bestfit material catalogs. Zodiac decides to use ebauches (rough movements) from other companies and merely finish them in house. * 1953: Zodiac introduces the Sea Wolf, the first serious watch for divers. It as a turnable bezel ring to measure elapsed time so that divers can keep track of oxygen remaining in their tanks. The watch is an instant hit not only with divers, but other sports enthusiasts seeking a robust watch with easy-to-read dial. Underwater Demolition Teams (UTD), which later became the Navy SEALs, choose the Sea Wolf as their "official" watch over their government-issued watches. The model remains the company's signature watch to this day. * 1971: Zodiac introduces the "Super Sea Wolf" with even great water resistance and incorporates orange into the dial and hands to make it even easier to read. 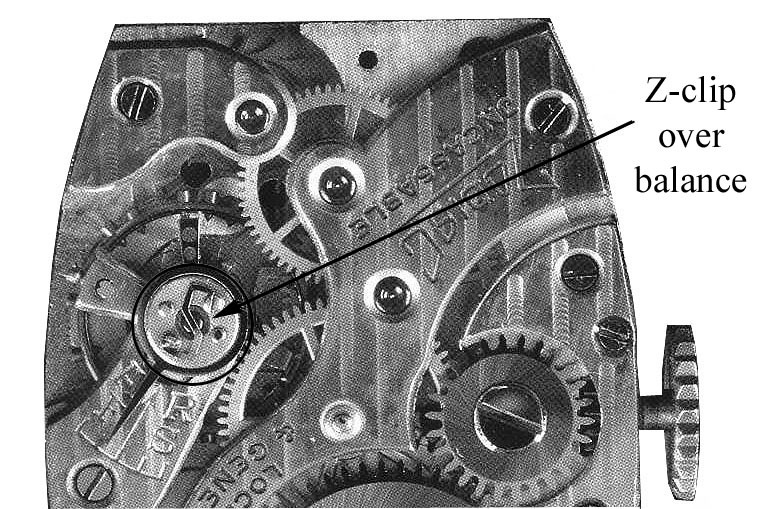 * 1971: The company introduces the "Astrographic" a unique automatic mystery dial watch. Dial calibrations are decaled onto the underside of the crystal. The model is made in round and square/cushion shape versions. The watch was a huge hit with consumers. Not only was the watch a novelty, but it was seen as a robust sport watch (complete with bracelet instead of leather band) AND it was automatic. * 1978: The last generation of the Calame family sells the company to a large Swiss corporation, and Zodiac is no longer family owned. OK, so much for the history up to 1978. The first development I want to talk about are the crystals for the Astrographic models. The problem was (and is) that if the crystals are scratched/scuffed (and they always did), you could only get the crystals from Zodiac. And when the company fell on hard times beginning in the late '70s, production of crystals (and indeed replacement parts for most vintage Zodiac watches) ceased, and existing supplies quickly dried up. Enter Thomas "Andy" Lewis, a watch technician and Zodiac collector from Ohio. He’s found a source to make the crystals for both the cushion and the round models, complete with the underside decals. As you can see, Andy's replacements (bottom) are very close to the originals (top). “The crystals that I have made are hardened mineral glass, so they are slightly superior to the originals,” says Lewis. “Another huge benefit over the originals is that mine are designed to fit the case exactly and be glued in. 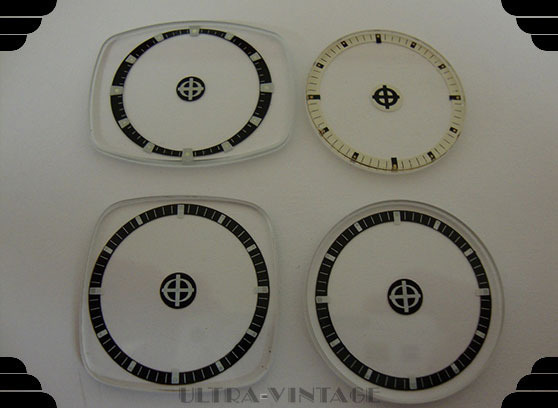 No need to worry about the gaskets that came with the old crystals and had to be installed to make the crystal fit correctly.” Lewis sells the crystals for $75 each plus shipping (uninstalled) and you or your watchmaker can install them (Lewis recommends ultraviolet cement). Or for an extra charge, Lewis will install it, though I recommend doing it yourself (or your watchmaker) since Lewis is almost always overbooked with repairs. 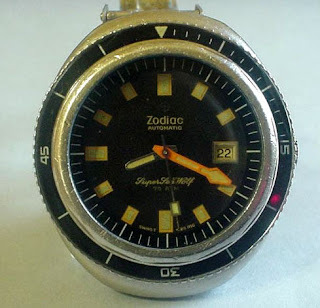 He also sells crystals for Zodiac’s “Super Sea Wolf” (also long unavailable from Zodiac) but these Lewis must install himself due to tiny variations in bezel sizes during the years the model was produced. To contact Lewis, visit www.ultra-vintage.com. Another facet of my 2005 story on Zodiac that I want to expand upon is the ownership of the Zodiac brand after the Calame family sold it in 1978. As previously stated, a large Swiss consortium (Dixi Group), bought a controlling interest in the company starting in 1978, and gained total ownership by 1979. The Calame family, which had run Zodiac since its beginning 1882, had simply floundered starting in the late ‘60s due to cheap Swiss mechanical export brands, Then, quartz watches delivered the knockout blow in the early- to mid-1970s. The next 11 years under Dixi ownership are generally regarded by vintage Zodiac collectors as the “dark years.” The brand all but lost its focus on its core market of sports watches, opting instead for dress watches of uninspired copycat designs of other manufacturers. Then, in 1990, a savior of sorts arrived in the form of Willy Gad Monnier, a well known figure in the Swiss watchmaking industry. Since the end of WWII, Monnier had climbed through the ranks and was perhaps at the pinnacle of his career with Heuer/Tag Heuer, even being CEO of that company for a time. But his calling presumably lay elsewhere. With a long-held passion for sport watches, he was saddened to see what had become of Zodiac and thought he could bring the brand back. So in a rather acrimonious parting with Heuer/Tag Heuer, Monnier purchased the brand. A 1990 brochure heralded the return of the Sea Wolf and Astrographic. Other iconic models would soon be re-introduced, including the SST 36,000, the Aerospace GMT, and the Corsair. Sadly, the iconic Sea Wolf was dropped in favor of a new “Sea Wolf II” which was only offered with a quartz movement. In 2001, Fossil Inc. approached Ken and Alan Genender, principals of the company, accepted an offer of $4.7 million for the Zodiac brand. It is one of the rare occasions in which the price paid for a watch brand is revealed, owing to the fact that Fossil Inc. was (and is) a publicly traded company (NASDAQ: FOS) and capital acquisitions must be reported to shareholders. I expand upon the various owners because die-hard Zodiac collectors are meticulously fussy about the pedigree of various models. The Super Sea Wolf model is a typical example … collectors take great pains to distinguish a Calame-era model, from the vastly different Monnier-era model, and from current version offered by Fossil. The Monnier-era Super Sea Wolf (left) and current version. 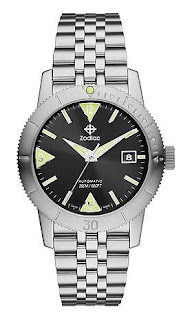 Another major development in Zodiac comes from the company that currently owns the brand – Fossil Inc. Back in 2005 when I first reported on the brand, Zodiac to my complete amazement had ceased production of the Sea Wolf, the company's most famous watch. This was, in my opinion, a huge blunder on Fossil’s part, sort of like if Chevy were to drop the Corvette. Well, the company has come around, and it now offers a model called the Super Sea Wolf 53. It’s been updated somewhat to reflect current tastes. For example the watch is 40mm in diameter versus the original watch at 35mm. But the watch is very true to the original spirit of the watch, (notice the reference to 53, the year the Sea Wolf was introduced), including a mechanical automatic movement, not quartz. And it’s priced at $1,295 retail ($1,095 if you’re willing to forego the stainless bracelet for a silicon strap) which in today’s world of mechanical watches is quite affordable. The company also offers a "Super Sea Wolf 68" which is a tribute to the original Calame-era Super Sea Wolf. I wish Fossil had not called both Sea Wolfs "Super" because it's kind of confusing but, hey, they never consulted me. Anyway, the retail price on that one is $1,595. They also offer an updated version of the cushion-shaped Astrographic, another watch that was missing from Zodiac’s lineup for several years. The Astrographic is priced at $1,295 and features a steel bracelet and mechanical automatic movement. Why am I even reporting the "new" Zodiac? I realize that many of you vintage collectors don’t care for modern watches. But you have to remember there are many watch enthusiasts out there who like the “look” of a vintage watch, but want such features as newer, better materials and machining methods, a warranty, and true water resistance for swimming, diving, etc. … all things that a vintage watch cannot offer. I have mixed feelings about whether to recommend buying current Zodiac models. While I'm happy that Fossil is finally bringing back the classic Zodiac models, Fossil is notorious for poor service, both to its retailers and to consumers. Retailers report they can't get band/bracelet parts and replacements. Ditto with case parts such as crowns and crystals. The Internet lists numerous complaints by customers about sending their watches to Fossil's service center (Metro Service Center in Dallas, Texas) which is also the same warranty service center for Zodiac. Fortunately, Fossil is a member of the Better Business Bureau, and the BBB has gone to bat for numerous consumers over the years and gotten results. But my question is, why does it have to get to that stage? Why doesn't Fossil resolve problems in the first place and avoid public airing of problems via the BBB? So my advice with buying a current Zodiac is assume the best, but prepare for the worst. The watches do appear to be solid, and have gotten good reviews by several respected websites, including Hodinkee. But watches do break during the warranty period, so be prepared. Save all paperwork with your watch, especially the receipt. The warranty card typically means nothing without the receipt! Meanwhile, out-of-warranty service can probably be done on most models by a qualified watchmaker, since the movements in most of Zodiac's classic remakes are made by ETA. Exceptions might be the models with compression cases (Super Sea Wolf, for example) which would likely need to go to Metro Service for out-of-warranty service. Finally, I wish to dispel a rumor that has started in recent years, and that is the notion that Heuer/Tag Heuer at one time made watches for Zodiac, that Zodiac watches are somehow a “poor-man’s version” of a Heuer/Tag Heuer. Even as I write this, there are several watches selling or recently sold on eBay described as being "made for Zodiac by Heuer." This is pure Internet urban myth, designed to artificially increase the perceived value of the watch, according to Butch Dunn, Zodiac collector, historian, and owner of the website www.vintagezodiacs.com. 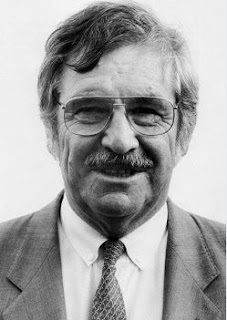 Says Dunn: “In 20 years now I have not turned up any documentation that ever confirmed, nor even suggested, that Heuer ever made any watches for Zodiac.” There are indeed several Zodiac watch models (chronographs in particular) that bear a remarkable resemblance to models by Heuer, and by other manufacturers for that matter. But that’s only because by the 1950s, most watch manufacturers were buying their cases, movements, dials, and bracelets from the same specialty companies, and assembling them into their particular version of the completed watch. 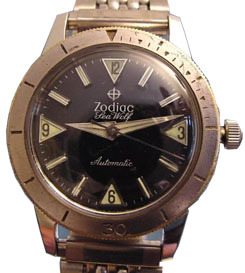 And speaking of Dunn, it is worth mentioning that www.vintagezodiacs.com is still the number one site (as it was in 2005) for the best and most complete information about VINTAGE (pre-Fossil) Zodiac watches. A companion site, www.zodiaccatalogs.com, operates on paid subscription and hosts an extensive collection of vintage Zodiac jeweler catalogs. Together, the two sites offer what I believe is the most comprehensive resource on vintage Zodiac watches to be found anywhere. Enjoy! Oh, and by the way, please click on the link below to visit my website and see the awesome collection of vintage watches I have for sale!